Williams Lea Walkin Drive for freshers in Chennai from 4th to 7th July 2014. 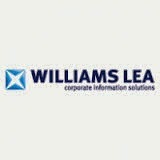 Williams Lea Recruitment drive for freshers as Document Specialist Trainee Position. B.Com, BA, B.Sc, BCA, MCA freshers jobs in Chennai. Candidates should have Good MS Office skills. Interested and eligible candidates can directly walkin to below mentioned address.